This is an informal experience sharing workshop for those wishing to teach yoga to refugees. Over the past two years, our focus at Tools for Inner Peace has increasingly been on refugee yoga. It has been wonderful to observe the growing interest and the development of a community of yoga teachers and psychotherapists who are excited about this work. Some have already participated in our first experience sharing weekends in the UK in May 2017 and April 2018, some joined a two-day seminar on teaching yoga for PTSD in Grempoli, Italy, in July 2016 or August 2017, and others have expressed interest in working with refugees. To continue building a network of those interested in refugee yoga, participants have requested that we organise a similar retreat once a year for members of this growing community. 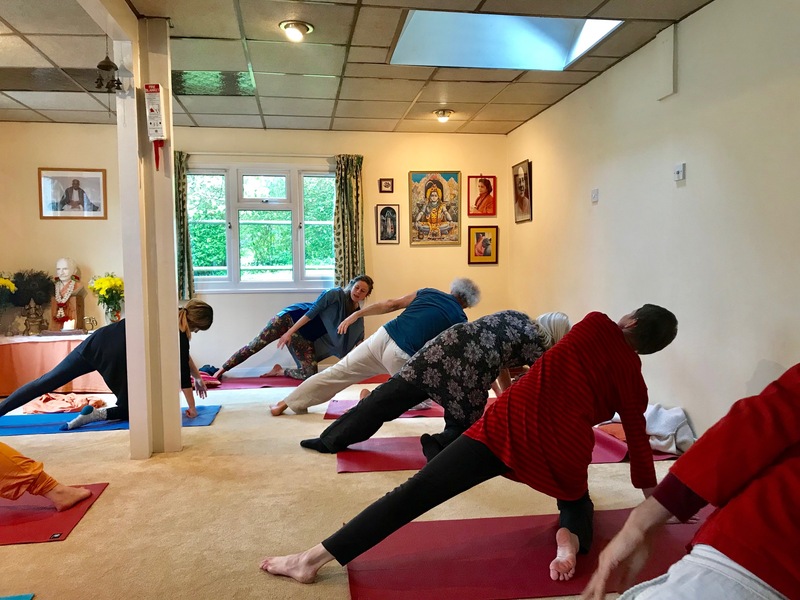 The next such weekend is expected to take place at the Patanjali Yoga Centre near Battle (about 1 1/2 hours south-east of London) on the weekend of 1-2 June 2019. We hope that you might be able to join us. What is special about teaching refugees and others suffering from trauma? How yoga helps recovery from trauma. Connecting with the body, freeing up the breath and releasing tensions. The importance of deep relaxation in letting go of trauma. As part of the weekend, there will also be karma yoga (including preparing meals together), and a Mahamrityunjaya havan. The contribution for the weekend is £60 to cover simple accommodation and meals. We will be starting at 10am on Saturday 29 June and concluding by 4pm on Sunday 30 June. Those who would like to arrive on the evening of Friday 28 June are welcome to do so at an additional cost of £20. We have limited spaces at the Patanjali Centre – so let us know soon if you would like to attend. It is important that the workshop teacher is aware of any factors that may affect your practice. This will be kept strictly confidential and is to ensure that alternative practices or variations are given when appropriate. Do you take any form of regular exercise? Do you have difficulty going to sleep or staying asleep through the night? Any other medical conditions or anything else the teacher may need to know? Have you had any surgery? If so, when and for what reason? Are you taking any medication? Please list, indicating what the medication is for and say for how long you have been taking it. Are you pregnant or have you given birth in the last 6 months? Have you practised yoga and meditation before? What kind and for how long? For retreats with children's programme, price per child half of the full course fee. After receiving confirmation of acceptance, you will be asked to transfer the enrolment fee via Paypal. For any cancellation until one month prior to the workshop, the fee will be returned, less 10% cancellation fee. After that the cancellation fee will be 30%.